Boys will be boys. 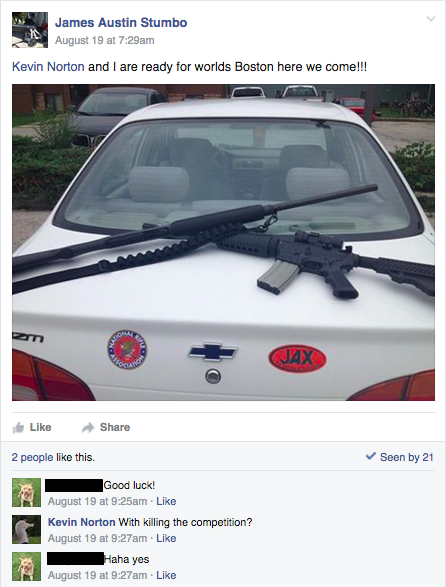 Note the NRA bumper sticker. This Saturday two Pokemon: the Trading Card Game players were arrested trying to enter the Pokemon World Championships in Boston, MA after posting photographs of weapons later found in the trunk of their car. Kevin Norton, 18, and James Stumbo, 27, were curiously tactiturn about why they brought an AR-15 and a 12-gauge shotgun to a game tournament, or why they carried the mint-looking weapons (and a big ‘ol pile of ammo) across state lines without a permit, which is itself a felony. The boys aren’t talking about their motivations now (probably a good idea) so it’s hard to tell whether this is a ‘massacre averted’ or just ‘weird and dumb decision noticed by police, who understandably took it seriously.’ It wouldn’t the be the first time dumbass gun nuts brought weapons to places weapons probably don’t belong, for no discernible reason at all. Many of these stories have tragic endings, so it’s understandable that the BPD took this really seriously. But surely this incident demonstrates the need for better gun control in this country. According to the SPLC, mass killings by cells of 1-2 angry white men occur, on average, once every 34 days. Not all of these events make the news – many of them barely make the local police blotter, especially if the only a few people are killed, and they happen to be related to the shooter. Some of them are retaliatory attacks by men who feel they have been wronged, or who have been rejected by women; so that the only way they can get justice for themselves is to explode like some kind of rage bomb, hurting everyone around them. Just think about that for a second. Once every month some idiot plans an attack like this and actually succeeds in killing somebody. So when cases like Norton & Stumbo happen, we have to wonder if the persons involved this time are violent white nationalists or contrarian edgelords trying to get attention. Why are guns so goddamned easy to get in this country? In particular, why are they so goddamned easy to get by angry, almost entirely white, straight men? Or, put it another way: why are white, cis, straight men so eager to respond to life’s downturns by shooting somebody? And why, when every 34 days (on average) when some white cis straight man gets that frustrated does nobody ask why the hell these guns aren’t harder to get? Because they are easy to get, at least in certain jurisdictions. I’m glad to live in New York City, where getting a permit for a long gun costs hundreds of dollars and a lot of time and trouble to obtain. You really must have a need for a long gun if you want to own one in NYC, because the frustration of turning in a handwritten application with two passport photos and a nonrefundable fee of $140 (plus $90 for fingerprints) to a particular NYPD office in a certain, specific time window is actually quite a bit of work. By comparison, in my hometown of Orange County, North Carolina, one handed in their long gun application to any sheriff’s office during business hours for a refundable fee of just five bucks. Five bucks! Now that’s what I call an affordable rampage. But that’s not even the floor of negligence in gun rights legislation. In Iowa, (where Norton and Stumbo hail from), you don’t need a permit to purchase a long gun at all. Meanwhile, the overproduction of guns in this country virtually ensures that new, used, and inherited guns will be easy to come by and cost very little to obtain. That’s what happens in a free market when you flood the market with product: the price falls. If we, as voters, don’t demand reform about this issue, it seems obvious that we’ll never get it. And if it doesn’t happen, I would assume that we can expect, on average, a mass killing by some angry man once every 34 days.